If you are like me, going to the bookstore in order to pick up only the one book I ordered the week before, paying and leaving is not something I can do easily do, unless I am very much in rush. Last Saturday, I took a good hour looking in all corners of the small bookshop nearby my house. I love books as objects on top of what they contain. They are beautiful, they make you travel, they give you good advice and they tell you wonderful stories. 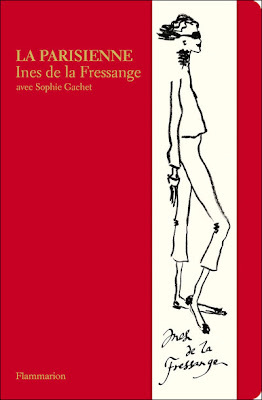 Attracted by the deep red cover, intrigued by the cute and stylish drawing I pickup "La Parisienne" by Inès de la Fressange and Sophie Gachet. Inès was, during the 1980's, Karl Lagerfeld's muse. She posed exclusively for Chanel during 5-6 years I think. Well, I did not know she could write and draw. What is that book all about ? Fun details you need to know if you want to adopt the real Paris style. Fashion, Beauty, Shopping addresses, Decorating tips, Hot places to dînne and be seen... As I said, this book is all about being a real "Parisienne". So far my favourite section ( I read 3/4 of it) is the first one regarding Fashion. What are the must have in your wardrobe, what are the do's and the don'ts in mixing items... Beautifully illustrated, fun to read, If you love Paris you NEED this book... no hesitation to have here. You do not read French ! no panic. It is available in English. You can even listen Inès tell you all about her book (see the video at the end of this post). Paris, Paris yes Parisian have style but are they the ONLY one in the world? Certainly not. Though Inès really knows what style and being stylish is, You and I do not have to agree with all the tips she gives us. Some of the guidelines, though, seam to be universal, even for a New York lady. What do they both say one should never do ? An overdose of animal prints is a definite NO, NO. Over doing it with jewellery could be a catastrophe. You have to choose: earring or necklace, not both. I really love both books. I intend on using both to guide me in expressing MY style, hopefully without to much "Faux Pas"
Click Here to watch the Parisian Chic Trailer. 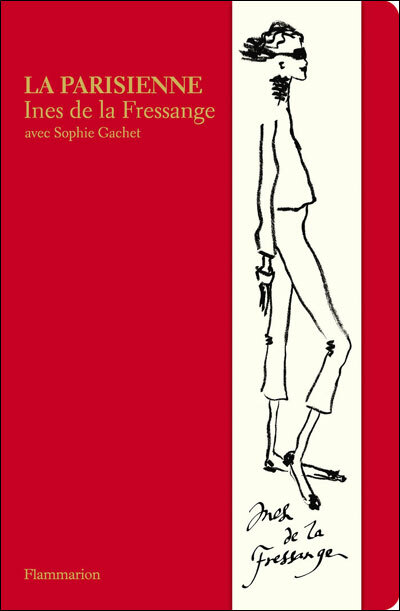 Si vous avez lu le livre d'Inès et habitez l'hexagone, donnez-moi vos impressions. Pourquoi pas les deux New York et Paris? Mes destinations préférées fashion. I own the second book and adore the illustrations. I would be attracted to the first book because of the gorgeous red cover. I love Ines because I love Roger Vivier shoes . The black buckle pilgrim pump rules. I hate Ines because she is 7 feet tall and can wear white jeans without a simple wrinkle anywhere. Great post! I'm on the waiting list for "Parisian Chic" from my library. Can't wait to read all about it. J'aime beaucoup Paris! What wonderful timing!! ALWAYS a wonderful subject!! Wow! That was a great post with great advice, I never thought finding a fashion guide book, no doubt, I'll find it in English or Spanish.